Micro-filmmaker Magazine’s Jeremy Hanke recently got in touch and asked if I would review his book, “Green Screen Made Easy”. I used to make a lot of micro- and no-budget movies packed full of VFX, but I usually avoided green-screen because I could never make it look good. Although those kind of projects are behind me, I agreed to the review because I figured that this book might help others succeed where I’d failed – and also I was interested to find out why I had failed! 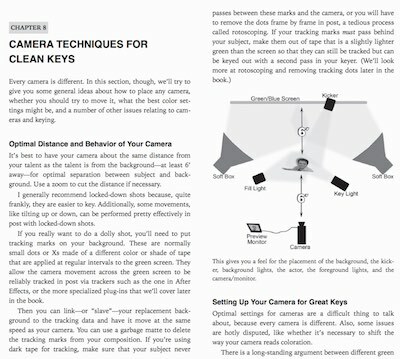 What Jeremy and his co-author Michele Terpstra set out to do is to cover the entire process from start to finish: defining chromakeying, buying or building a green screen, lighting and shooting it, sourcing or shooting background plates, choosing keying software, and all aspects of the keying itself. The book is aimed at no-budget filmmakers, hobbyists or aspiring professionals making self-funded or crowd-funded productions, those digital auteurs who are often their own producers, writers, DPs, editors, colourists and VFX artists. Perhaps you’ve tried green-screening before and been disappointed with the results. Perhaps you’ve always seen it as a bit too “techie” for you. Perhaps the unpaid VFX artist you had lined up for your sci-fi feature just pulled out. Or perhaps you’ve already reached a certain level of competency with keying and now you want to step up a level for your next production. If any of these scenarios ring true with you, I believe you’ll find this book very useful. 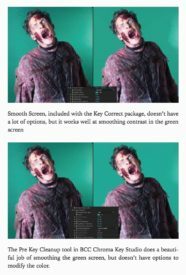 “Green Screen Made Easy” is divided into two halves, the first half (by Jeremy) on prepping and executing your green screen shoot, and the second half (by Michele) on the postproduction process. Both authors clearly write from extensive first-hand experience; throughout the text are the kind of tips and work-arounds that only come from long practice. By necessity there is a fair amount of technical content, but everything is lucidly explained and there’s a handy glossary if any of the terms are unfamiliar to you. The section on lighting and shooting green screen material contained few surprises for me as a cinematographer – see my post on green screen for my own tips on this subject – but will be very useful to those newer to the field. The chapters on equipment are very thorough, considering everything from which camera and settings to choose to ensure the best key later on, to buying or building a mobile green screen, or even kitting out your own green screen studio – all with various alternatives to suit any budget. The postproduction chapters revealed clearly why I struggled with keying in the past. Michele explains how the process is much more than simply pulling a single key, and can involve footage clean-up, garbage matting, a core key and a separate edge key, spill suppression, hold-out matting and light wrapping. The book guides you through all these steps, and outlines the pros and cons of the software and plug-in options for each step. Once you’ve read this book, I’d say the only other thing you’ll need before you can start successfully green-screening is to watch some YouTube tutorial videos specific to your software. While the instructions in the book look pretty good (as far as I can tell without attempting to follow them) the medium of text seems a little restrictive in teaching what is inherently a visual process. 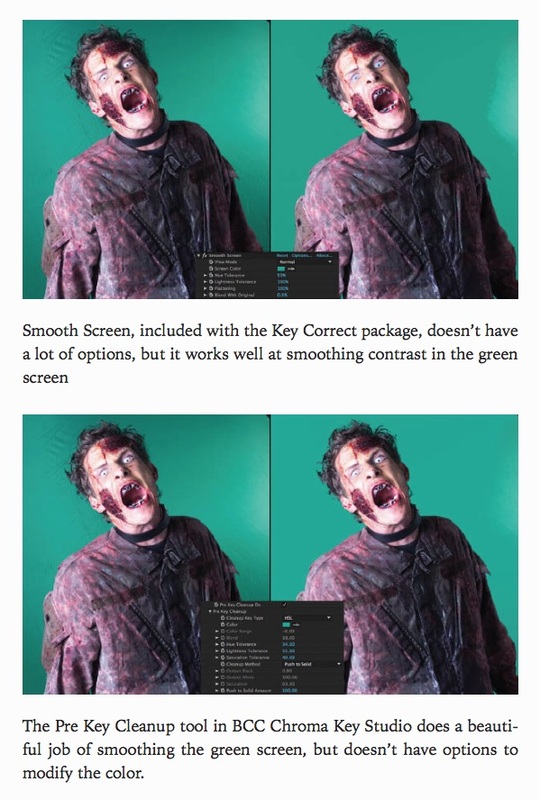 There are explanatory images throughout “Green Screen Made Easy”, but in the ebook version at least I found it difficult to discern the subtle differences in some of the before-and-after comparisons. 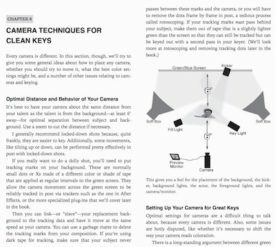 Ultimately what will make you the best “green-screener” is practice, practice, practice, but by reading this book first you’ll give yourself a rock-solid foundation, an appreciation of the entire process from start to finish, and the insider knowledge to avoid a lot of time-sucking pitfalls. And keep it handy, because you’ll be sure to thumb through it and re-read those handy tips throughout your prep, production and post. 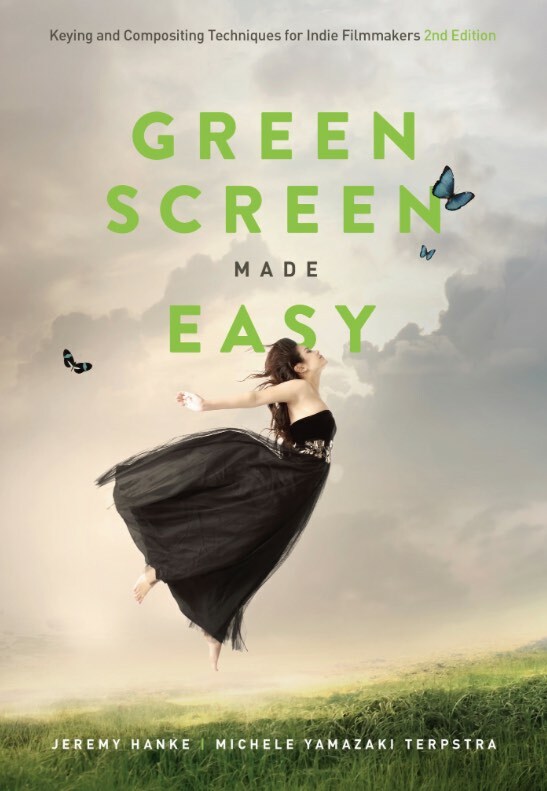 “Green Screen Made Easy” is available in paperback and ebook editions from Amazon.